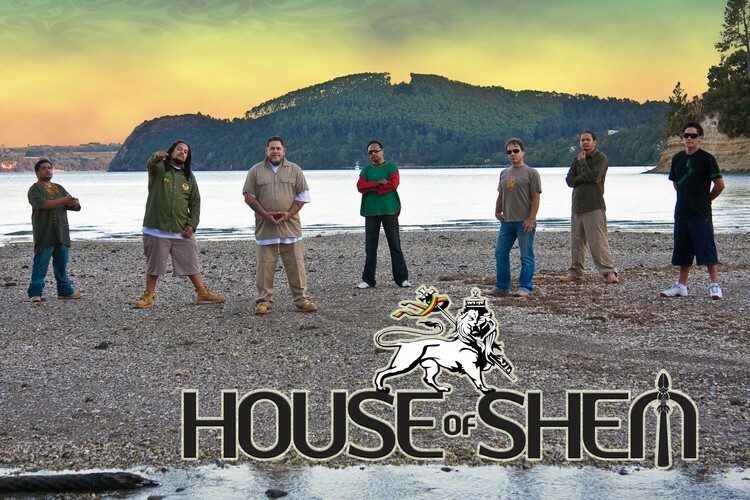 House of Shem hail from Aotearoa, New Zealand and like many legendary reggae groups this band is built around the classic harmony trio format. At the helm is Carl Perkins, a man with over thirty years experience writing and playing reggae music. As a former member of Herbs, Mana and the Twelve Tribes of Israel Band amongst others, Carl’s musical credentials are impeccable. Joining him up front are two of his sons, Te Omeka and Isaiah who not only provide harmonies but both of whom also write, take turns at singing lead and play keyboards as well. It is this blood link and family bond that renders the sound of their combined voices as something really extraordinary. Each of the three has their own distinct song writing style and voice, effectively giving the band three different lead singers. The harmonies are sublime and the precision of their ensemble performance is phenomenal. Credit must also go to the rhythm section – certainly one of the tightest you are ever likely to hear down in the South Pacific Aotearoa New Zealand, with Kaya Webster who is a “one-drop” prodigy, having played drums for the Twelve Tribes of Israel Band since he was of primary school age and Francis Harawira, a heavy-duty bassist also formerly of the T.T.I. Band and Token Village. Rounding out the sound is the exceptionally gifted guitarist Roy Venkataraman – a seasoned veteran himself who toured and played with The Wailers band for a number of years and the soul infused horns of Chris Nielson on saxophone. To date, four House of Shem songs have been featured on the best-selling “Conscious Roots” compilations (with combined sales in excess of 30,000 units) and in May of 2008 their debut album, “Keep Rising” was released. The album is an especially strong opening statement from the group and with each of the family members splitting the composition credits evenly it neatly demonstrates the bands musical range and diversity of styles. There is something for everyone on here with catchy pop songs, deep devotional hymns, lovers rock and dancehall crowd-pleasers all included and vying for your attention. Over the last couple of years the band has extensively toured the country. They have become a regular fixture at annual festivals such as Soundsplash , Parihaka Peace Festival, Raggamuffin, One Love, Parachute Fest, Tribal Pride, Rhythm & Vines, Nga Puhi fest, Phat 08 and have forged a loyal fan base not just in the main centres, but also in the smaller rural communities. April 2009 sees the debut album “Keep Rising” distributed through Shock in Australia & Pacific Hawaiian in Hawaii with more interest worldwide. The House of Shem live experience is an unforgettable occasion – a rare mixture of power and beauty. Whether you are Rasta or raver, this band’s incredible tightness, heavenly harmonies, conscious lyrics and blend of traditional and contemporary reggae styles will leave you spellbound.